Do people really put razor blades in apples on Halloween? All Hallows Eve is coming. In less than a week, I’ll be sitting on the floor watching my boys dump out the contents of their trick or treat bags. Like any conscientious father, I will sift through their loot (stealing only the occasional Lemonhead) on the lookout for questionable items. Fresh fruit? Someone might have pushed a needle or razor blade in there. Into the compost. Homemade cookies or popcorn balls? No telling what could be in those. Rat poison. Heroine. Anything at all. Into the trash. I do this because my father did it (though he was more partial to Baby Ruths), and I want my children to be safe. But is it really necessary? Has anyone ever actually been killed by Halloween candy? For real answers, I went to the all-knowing debunkers of urban myth at Snopes. A 2005 post by Barbara Mikkelson digs deep into the cases mentioned by Largo, using arrest records, court documents, and other firsthand sources. Admittedly, Mikkleson’s research indicates that two out of the three children cited by Largo were in fact fatally poisoned on Halloween. But don’t forbid your children from going door to door just yet. As it turns out, none of the incidents that Mikkelson documents were the random acts of a homicidal stranger. Most were perpetrated by relatives using the idea of random poisonings to disguise deliberate murder or to cover up evidence of other crimes. By way of illustration, consider the the 1974 murder of Timothy O’Bryan by his father, who gave the child Pixie Stix filled with cyanide. While little Timmy was killed for insurance money, other sources falsely attribute his death to a random poisoning. In Final Exits , Largo incorrectly claims that the older O’Bryan was trying to do in his neighbor’s obnoxious children and that his own son’s poisoning was an accident. A comparable iincident occurred in 1970, when five year old Kevin Toston lapsed into a coma and died of a heroine overdose. It was later found that some of his Halloween candy had been sprinkled with the drug. While Kevin’s death is reported as a random poisoning in Final Exits and elsewhere, the truth is more prosaic. That Halloween, Kevin became fatally curious about his Uncle’s heroine stash, and the drug was put in has candy afterward to divert suspicion. In short, scary relatives are a greater danger on Halloween than scary neighbors. Finally, there is the strange case of Helen Pfeil. Annoyed by teenage trick-or-treaters, Pfeil greeted anyone she felt was too old with bags of inedible “treats.” These included dog biscuits, steel wool, and ant pellets. These were clearly labeled as poison in both print and the traditional skull and crossbones. No teens were stupid enough to eat them, and no one was hurt. Regardless, Pfeil was convicted of child endangerment and received a suspended sentence. This somewhat unexciting chain of events has been livened up by subsequent reporters. Final Exits asserts that Pfeil covered her fake treats with chocolate and that a small child died from eating an ant pellet. According to Snopes, neither is true. So much for poisoned candy. Sadly, apple tampering does actually occur, though less frequently than is generally believed. 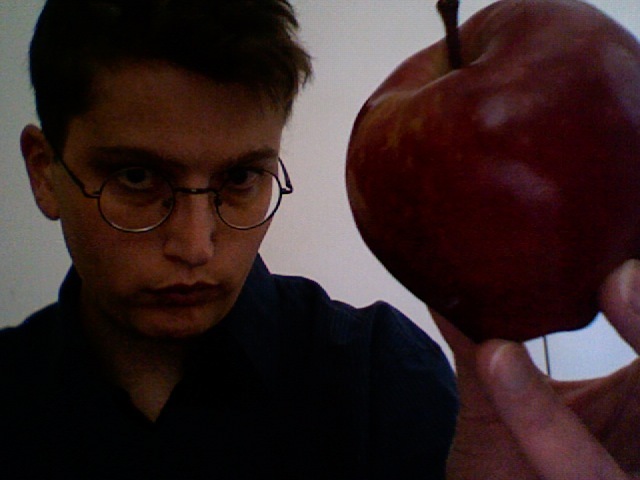 Additionally, Mikkelson attests that not a single child has been grievously injured by sharp objects in hidden in fruit. Most tampering of this sort was discovered by parents, or by the children themselves, before injury could occur. The majority of children who bit into booby-trapped apples came away more frightened than hurt. Only a few required ER visits. No one has ever been killed by a razor blade in an apple. So what are the real dangers of All Hallows Eve? The number one killer is traffic. Nationally, there are more than two-hundred pedestrian fatalities every Halloween, four times as many as an average night. So go ahead and eat that apple, boys and girls. Chances are it won’t hurt you. Just be sure to look both ways before you cross the street. And save some Lemonheads for me. So you’re on a Greyhound bus, motoring through the Canadian wilderness at night. Many of the other passengers are asleep. The Legend of Zorro is playing. And suddenly you hear a bloodcurdling scream. Not your typical reaction to bus travel. Or, for that matter, Antonio Banderas. You turn to see a Chinese man, wearing sunglasses (yes at night), standing over another passenger with a large Rambo-style hunting knife. 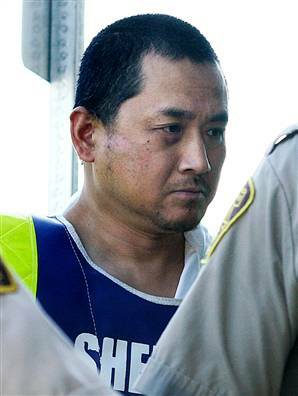 The man, one Vincent Weiguang Li, plunged the blade into the unsuspecting Tim McLean a total of 40 times. As the attack continued the bus driver, Mr. Caton, and the other 34 passengers fled the vehicle. They waited for police along a deserted stretch of the Trans-Canada Highway (near Portage la Prairie, Manitoba). A truck driver stopped at the scene. Together with the Mr. Caton, they boarded the bus only to find Mr. Li slicing off the head. He continued to gut up the body, storing the victim’s nose, ear, and part of the mouth in a plastic bag. Perhaps to munch on later. 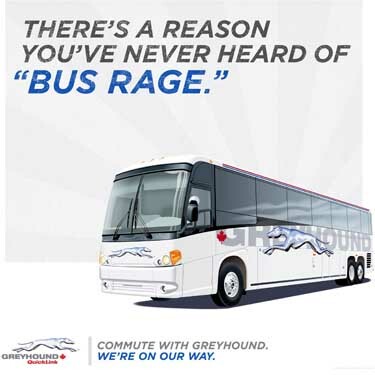 Before this incident, Greyhound had run an ad stating, “There’s a reason you’ve never heard of ‘BUS RAGE’”. The ad was withdrawn after the incident, yet perhaps it is correct. By all accounts, Mr. Li was not filled with rage. Only homicidal mania. Police laid siege to the bus for several hours. One officer reported seeing Mr. Li hacking off bits of the body and eating them. The attacker shouted, “I have to stay on this bus forever,” but later tried to escape through a window and was apprehended. Mr. Li was a 40-year-old Wal-Mart employee (won’t be seeing any endorsement from him), and a paperboy. This last occupation might have lead to his nocturnal lunacy. Only 10 days before the attack, he delivered copies of the Edmonton Sun with an article about Nathan Carlson and his research on the Wendigo. The Wendigo is a horrific creature with a ravenous appetite for human flesh. It could possess people and turn them into cannibals. Take at look at the movie Ravenous with Robert Carlyle as the crazy flesh eater. Algernon Blackwood’s 1910 story, “The Wendigo,” introduced the myth to horror fiction. It is part of the traditional belief systems of various Algonquian-speaking tribes in the northern United States and Canada. The article by Carlson gave several examples, including a Cree trapper named Swift River. He killed and ate his wife, six kids, mother and brother in the woods northeast of Edmonton in the winter of 1878-79. Prior to the event, he suffered from screaming fits and nightmares.